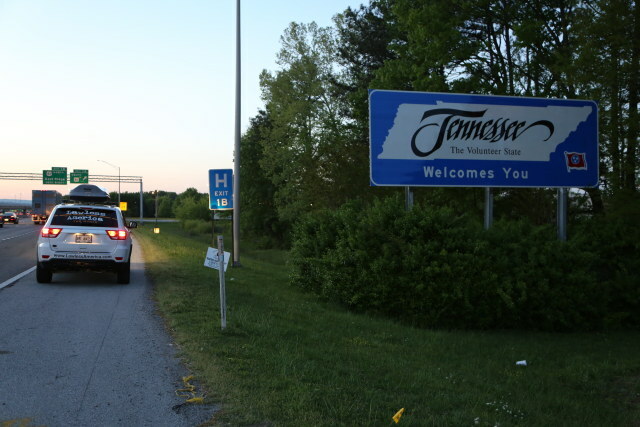 I am still in Sevierville Tennessee, the first of several stops in Tennessee. Due to pain from oral surgery and drowsiness from increased medication, I had to postpone scheduled filming on April 27, 2013. It's Day 319 for Lawless America...The Movie. I was able to sit at the computer and enter data for people who want to be filmed. It's a never-ending process. I entered hundreds yesterday. I have 50 emailers to go, and then there may be as many as 1,000 phone callers to add. I believe we are well over 5,000, but I have to delete dupes before I can quote a number. I will definitely be visiting Jackson and Biloxi Mississippi; New Orleans and Baton Rouge Louisiana; Houston, San Antonio, Austin, Dallas, Fort Worth, and a few other towns in Texas. I will try to schedule myself to visit any town where there is a good story or location that is important to a good story. I need names and addresses as I must enter all of this data in a trip routing software, and then that will be loaded into one of the GPS units. I was in a lot of pain yesterday. I feel a little better this morning. I'll be fine. My contract with Verizon expired, so it was time for a new phone. We also canceled our land lines, so I now have one number on one phone (and one less phone to deal with is well worth it). I learned quickly that entering into a new contract often is not good. I have unlimited data, which is invaluable to me. So, I bought an iPhone 4 (rather than a 5 as I could buy one for a reasonable price). If anyone wants to buy an iPhone 2, I have one to sell. I am traveling much leaner this time. I started the last trip with an RV load of stuff in the Jeep. One of my first stops was FedEx to ship a bunch of it home. This time, the Jeep is not overloaded, and none of the windows are obscured. I removed the spare tire, so that compartment is being used for items that I may never or seldom need (tools, first aid kit, manuals, signs). I am excited about using the laptop as my GPS with a program that allows me to enter each of my stops from an Excel file. So, one upload, and all the stops for the next state are in, and it routes me the most efficient way. I am learning to operate several cameras by remote control. As soon as the sun comes out again, I will be mounting one of the cameras on the exterior of the Jeep. The move of www.LawlessAmerica.com to BulkRegister still is not complete. The tech guy says our huge database is not yet working. But at least we got away from GoDaddy, where they threatend us with removal because our database was so big. Does anyone know a criminal defense attorney who would work pro bono to handle Jimmie Robinson's attempt to have Judge Richard Vance disqualified and the hearing for a new trial re-set? The family is long since out of money. One con artist scammed them and their friends out of thousands. PLEASE help if you know anyone. The attorney could be from any state. Please tune in to the Lawless America Show on TalkShoe Sunday, April 28, 2013 at 9 pm Eastern Time. 9-11 pm. We will be discussing the effort we are making with grand juries in June. if you want justice, this may be your best hope.